No more lies. The president broke the law. Well I have been having connection issues and I want to thank all the new comments. 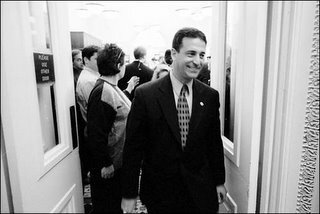 The past week has been a tumultuous one with the apparent abandonment of the party and the rallying that I have been seeing on other fronts in support of Feingold over the censure issue. First there was the accusation of grandstanding, then the hopes that the censure could be voted away by Boehner quickly. Next is this editorial that I was shocked to see in the NYT. I hate knocking the press because it smacks of a sore loser mentality. I felt betrayed. I have read this paper since I was a kid (my dad is from Brooklyn). I have assiduously followed events by reading it and they have made so many mistakes over the past 4 years. Between the Judy Miller issues, which includes the build up to the war in Iraq and then the wait on reporting the NSA issue til after the election I have stuck with them because they are an institution but they seemed to have missed the point. Plus their accusations, if they are any indication of the future, indicate to me a go along to get along attitude that is inappropriate to the current issues facing this country. After countless articles about Bush violating the law and everything wrong with the administration and complicity with the war in Iraq they specifically make an editorial AGAIST censure. It smacks of lazy journalism. The reason, which Feingold stated, is that there are no other avenues. Feingold and the Democrats have tried to get the information and the administration will not share it. It is silly to see two branches paralyzed by a bureaucratic catch 22. I.e. You can't censure unless you know everything and you can't know anything cause it is classified. This lack of historical frame of reference is just insulting with another editorial on Tuesday about Andrew Jackson. It is just irresponsible. First of all if you take the premise of the article that Feingold should worry about getting along with Bush; I don't think they are gonna have a tea party together anytime soon anyway. For many people this is going to be where they get their knowledge about censure from and to equate the interpersonal rivalries and cabinet mechanics from another time period to the current situation is too obtuse for chance. Who is the NYT pulling for? It certainly seems to be some other Senator. I don't think that the Times does understand the frustration of Senator Feingold and most Americans with the flagrant lying and law breaking of this government. They see it as a bit of political gamesman ship much like the Democrats who think that they can wait in the wings. They think they are being cunning. However it ceases to be politics when the law is broken. It becomes a coup at that point. A mild mannered and distant one but a coup nonetheless. Senator Feingold understands that we are not a nation of gods or men but a nation of laws. To strike at the laws of this country is to strike at the stability and freedom that every American was promised by the founders of this country. There is of course no excuse for the NYT. If I can watch the speech then I can understand why Feingold is putting this resolution forward. To cloud the issue in a pretense of intellectuality and "fairness" is to ignore that some things are true and some things are not. The truth is what we are looking for in the paper isn't it. Thank god for Comedy Central- at least I can still get the news somewhere. More on this thread: the Judiciary Committee held its hearing on Feingold's censure motion today. It was a very important discussion (I'm being mild here) and I'm told that ONE OTHER DEMOCRAT SHOWED UP!! That's ranking minority member Patrick Leahy. Kennedy? Feinstein? Biden? ... Nada. Of what use is this political party? Middleton, Wi is my hometown as well as Sen Feingold hence the blog. I have always been interested in politics and I was in student senate at MATC. I was nominated by Gov. McCallum to the Higher Education Aids Board in WI but I transferred to UW and they needed a tech school representative. I was also on the Wisconsin Student Goverment. I live in Minneapolis now. I am on the road right now since I started a different job but I encourage anyone interested to check in with joel clemmer at http://www.minnesotaforfeingold.org/ I hope to return to this blog more connsistantly as soon as the midterms are resolved. Fool cain't get fooled agin! We have seen the enemy and it is us.